You might go to Rick Reilly’s new book to read up on Donald Trump on the links, but two other golfing presidents, Bush I and Bush II, make some fine appearances and have never looked better. Reilly quotes another Texas golf legend, Ben Crenshaw, with this summation: “The Bushes don’t cheat.” In case you don’t know the theme of the book, this observation is presented in contrast to the scorecard habits of the sitting president. When The New Yorker covers golf, it’s an occasion. David Owen, who wrote a fascinating biography of Clifford Roberts years ago, has an interesting and unexpected piece, now up on the magazine’s website, about the golfing polymath Marion Hollins, and the example she provided Roberts and Bobby Jones, the co-founders of Augusta National and the Masters. 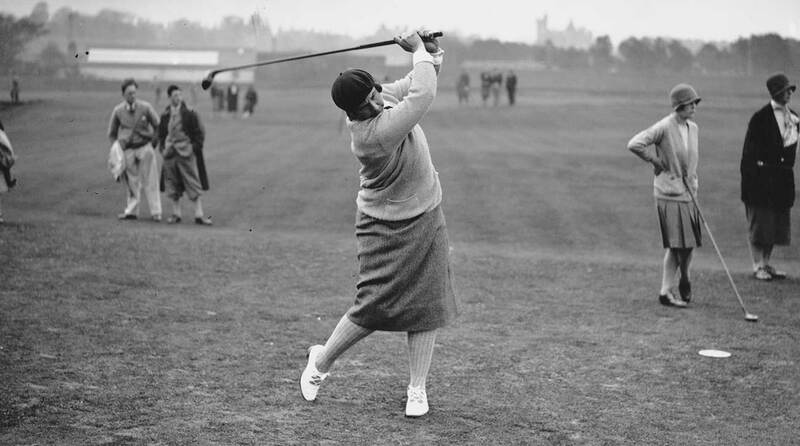 American amateur golfer Marion Hollins hits a drive during the second day of the 1929 Ladies Open Golf Championship in St. Andrews, Scotland. It’s working. Did you know much, or anything, about Jennifer Kupcho before this week? This reporter did not. Imagine all the many girls catching all this for the first time, thinking about Kupcho’s path there (via Wake Forest) and how they might like to try to do the same. Trying is enough. Some guys are playing Valero this week, looking for a payday and maybe a last-chance invitation to Augusta. Some are at Augusta, acclimating. Jon Rahm is playing in a member-guest event at the Silverleaf Club in Scottsdale, where he will have his work cut out for him. Rahm is playing in the event as a +7. His partner, Tim Mickelson, Phil’s kid brother and caddie, is playing as a +3. Easy money? No. Good time? Highly likely. Good-looking course, too. When the kids compete in the finals of the Drive, Chip and Putt competition at Augusta National on Sunday, you can be sure that officials from the USGA will be watching closely. When some of the best junior golfers started going to the belly putter before they even knew the word yip, the USGA started to worry about anchored putting in earnest. Now, many of the kids straddle their putting line, get their fingers in the air and do the dance of AimPoint. Dustin Johnson and Adam Scott and others will tell you it helps your putting game, but it’s tedious to look at and makes the game slower. You can guess how the USGA feels about it. If enough kids start doing it, you can also guess what might happen next. Four words I love to type, this time of year.